According to an article in the MetroWest Daily News, a Framingham couple was arrested last week for allegedly selling cocaine and heroin out of their apartment. The man and woman were arrested at their home, located at 140 Franklin Street. According to the article, the police began investigating the pair approximately one month ago after they received a tip that the two were selling drugs out of the apartment. During the investigation, confidential informants allegedly bought drugs from the couple inside the home. The undercover purchases led to the issuance and execution of a search warrant for the apartment. During the course of the search, the police found 40 plastic bags of heroin, totaling 17.5 grams, and 7.5 grams of cocaine. The police also reportedly found a stun gun and a .22 caliber bullet. The police further reported that the door to the apartment had more bolts and locks than the “average” apartment. Both the man and woman were charged with possession with intent to distribute heroin and cocaine, possession of ammunition without a firearm identification card, and illegal possession of a stun gun. While the pair may have some trouble defending the ammunition and stun gun charges, they both appear to have a defense of straight possession in relation to the drug charges. 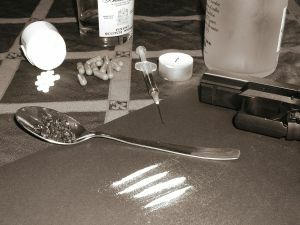 To prove that they each possessed the heroin and cocaine with the intent to distribute it under G. L. c. 94C, §§ 32 and 32A, the Commonwealth must prove the following beyond a reasonable doubt: (1) that the substances were in fact heroin and cocaine; (2) that both the man and the woman respectively possessed the heroin and cocaine with the intent to distribute it to another person or person; and (3) that they did so knowingly and intentionally. While the police may use information from confidential informants to obtain search warrants, the Commonwealth generally does not call such informants to testify to undercover purchases at trial. The reasoning behind this practice is that the police do not need to provide the identity of a confidential informant to obtain a valid search warrant, as long as the police establish that the informant had a basis of knowledge for the information provided, and that the informant is reliable. In contrast, if the confidential informant were to testify at trial that he or she had purchased drugs from the defendant(s), his or her identity would no longer be confidential, as the informant would be testifying in open court. Given the fact that virtually all confidential informants value their anonymity, they would not be inclined to participate in undercover buys if they knew that they would be called to testify at trial. Assuming the Commonwealth follows this practice in this case, it would have to proceed solely on the evidence obtained as a result of the search, namely, the drugs. Since both the man and woman were in the apartment, they can argue that the drugs were for their own personal use and that they did not have the intent to sell the drugs. Additionally, there are a number of other indicators that may be used to show an intent to distribute that were not present at the apartment. Specifically, individuals that are engaged in the distribution of drugs as opposed to personal use often have packaging items, such as plastic baggies, as well as measuring tools, such as scales. Drug distributors also tend to have a large quantity of cash on hand, and may also have a drug ledger, or some other sort of record keeping mechanism to keep track of sales. Given the fact that none of these items were reported as being present, both the man and woman could be in a strong position to argue that they were not distributing the drugs, but rather, were using the drugs themselves. This argument is made even stronger by the fact that it was the two of them, as two users would naturally use more drugs than an individual user. Even though the pair may have strong arguments against distribution, they will both still need defense attorneys who are willing and able to challenge the prosecution’s evidence and demonstrate the weaknesses in the government’s case. If you or a loved one is charged with a drug offense where the evidence is weak, you will likewise need a skilled attorney who can defend your case. Attorney Daniel Cappetta has handled dozens of drug cases for his clients and is willing to do what it takes to obtain a favorable resolution – whether it be a trial, or some other disposition. Call him for a free consultation today.